My first bonsai, what do you think? 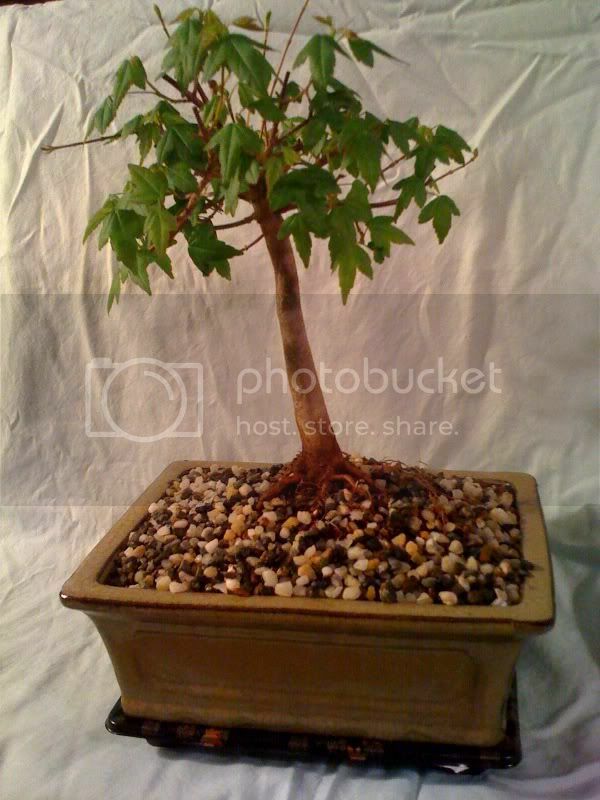 It's a trident maple. Hey WMS - nice little trident. Where did you find him? The nebari is spread nicely. Great start for a fine tree. I'm sure he will give you years of joy and inspiration. That really is a very nice maple. The canopy already has a great shape. You are off to a good start. I got it for ten dollars at the local bonsai nursery, without the pot of course. I flushed all the soil out and repositioned all the nebari the repotted, however I'm going to put it back into the ground or a larger pot at the end of the season to give it some more growth. I think it's a great find for 10$. Looks like you've got a great start. I'm probably lucky I can't find any starts that nice for that little or I'd probably run out of space or cash (whichever came first). You got a great deal on that one!